Good things skin and body care is a brand primarily aimed at young skin, but can be used by anyone of any age. The lady behind the brand is Alice Hart-Davies a British beauty journalist who with in her words a little help with the technical side of things created Good Things. Good things don't contain Animal Ingredients, Mineral oils, Parabens or Sodium Laureth Sulphate which I personally do look for when buying skin care or body products, my youngest daughter is vegetarian so she is especially pleased that the products don't contain animal ingredients and I am happy that should she use Good Things, she won't be using products with any of the other "bad" ingredients in either. The products contain 'super fruits' as well as other ingredients and the Good Things website is excellent and really informative, they have a section all about the super fruits used and other ingredients they use in their products, each super fruit is listed with a description telling the reader what it is beneficial for, I found this really helpful and informative. 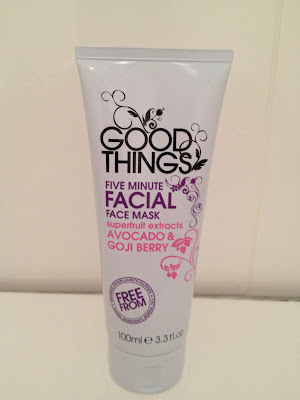 As I said Good Things is aimed at younger skin, but it is definitely something that can be used by anyone whatever age they may be, as you know I have just turned reached the big 4 0. There is a variety of products suitable for different skin types and different problems someone may have with their skin. And another bonus is they smell amazing! They are gentle yet effective and are also sold at a very reasonable price. They are sold in Boots, Superdrug, Sainsburys so there are many ways to purchase the products, Good Things also have a Facebook page as well as their website and regularly on both the website and Facebook page their is information on any special offers the stores that sell the products have on the Good Things brand, I think that is a really helpful thing, and wish more brands did this. Two of the Good Things products I have recently been using are the Total Wipe Out Cleansing Facial Wipes* and the Five Minute Facial Face Mask* I have used both products for the last 2-3 weeks now so I could give you an honest review. The first thing I noticed was the smell of the products, they smell lovely, I love fruity smells and absolutely hate herbally smells so these products are right up my street. As a rule I don't normally use face wipes to remove my make up, as you know I have very dry skin and find that face wipes make it feel much more dry, so I was a little reluctant to use the wipes, but I was pleasantly surprised, the wipes smell lovely, they have the super fruit extracts of Raspberry and Cranberry both of which have calming properties and the wipes also contain vitamin E and Aloe Vera. The wipes are moist but not so moist that they left my face needing to be towel dried, and they removed all my make up. The first time I used the wipes I used one and then used another to remove any left over make up and there wasn't any, so one wipe was fine to remove all my make up, I had on what I would call a full face of make up too, foundation, concealer, blush, eye shadow, mascara, brow pencil and lipstick, I used one side of the wipe to remove my face make up and then the other side of the wipe to remove my eye make up. My skin wasn't left feeling dry or itchy as it has done when I have tried previous brands of face wipes so I was really pleased, and I have been using the wipes now for the last 2-3 weeks and haven't noticed a change to my skin, it isn't any drier than it was so I am really pleased about that. The wipes haven't dried out at all and still feel as moist as they did when I first opened them, I still have some wipes left and have been using them for 2-3 weeks, admittedly I don't wear make up every day but if you did they would last 25 days if like me you used one wipe to remove your make up. The wipes are biodegradable, suitable for Vegetarians and Vegans and retail at £3.49 for 25 wipes which for such a great product with great ingredients is a brilliant price. I was very excited to try the face mask as it contains Green Clay and Kaolin, I have been using an Alpha H clay mask for the past few months and I cannot stand the smell of it, the product itself is fine but I won't ever re purchase it because of the strong scent it is so off putting, I have been researching clay masks for a good while now as I was on the lookout for a replacement for the Alpha H but they all seem to contain ingredients similar to the Alpha H one which means the dreaded scent! So I was so pleased when I read the ingredients and saw it contained the green clay and kaolin which are the ingredients I wanted in a clay mask. 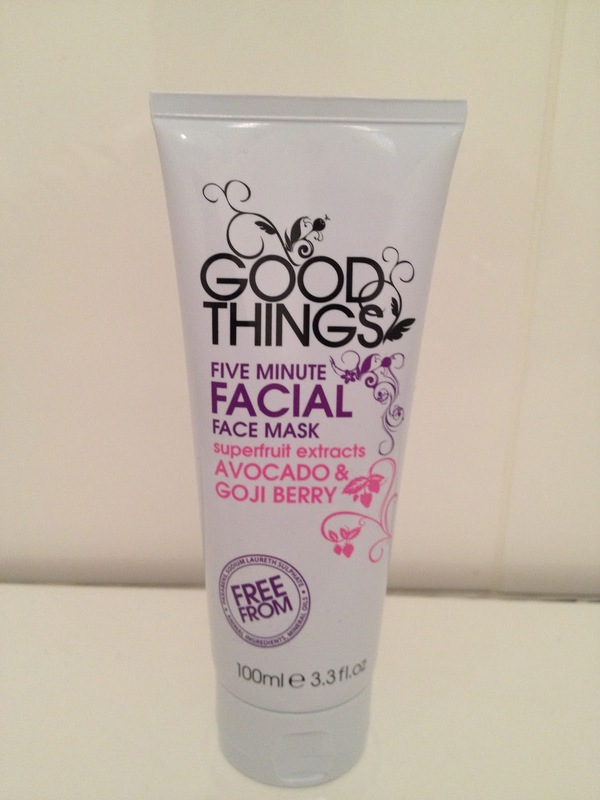 The scent of the Good Things mask is lovely and fruity, it contains the super fruits Avacado and Goji Berry. Avacado is great for it's moisturising properties and contains vitamins A,D and E and Goji Berries contain anti inflammatory properties and help to energise the skin. The mask claims to make skin clearer, brighter and smoother, and contains green clay and kaolin to draw out impurities, avacado oil to moisturise, goji berry extract to soothe and willow bark extract for radiance. The mask can be used weekly or whenever you feel your skin needs it. I used the mask once a week, twice in the first week as I wanted to try it as soon as I got it! I applied the mask all over my face avoiding my eye area, and left it for 5 minutes to dry and then removed it with a flannel which I had ran under hand hot water, this is how I remove all my face masks but the directions on the packaging were to do this or to rinse with water. The mask didn't feel irritating when it was applied, it is a creamy texture and rubbed in nicely with ease, after 5 minutes it was dry and I removed it and patted my face dry with a towel. I was very impressed, my face felt soft and smooth and looked lovely, I got the same effects as I do using my other clay mask which is over £20 more expensive and the smell of the Good Things mask was lovely, I will definitely re purchase this mask, it is lovely and made my skin look and feel amazing. It retails at £5.99 for 100ml and is definitely worth it, I got the same benefits as I have done using a much more expensive clay mask, and the smell of this is lovely too, so an added bonus. Overall I have to say I am very impressed with the two products I have been trying and will definitely be re purchasing the face mask and looking into the brand at other products. My youngest daughter who is 15, almost 16 uses the Good Things Fresh Start Creamy Cleanser and the Face The Day Moisturiser as well as the Five Minute Facial Face mask and she had suffered with under the skin spots which were really bothering her and they are so much better now since using these products, so it does go to show that the products can be used by anyone of any age. I have very dry skin, suffer from eczema and sensitive skin and the scent of some products really affects me since suffering from my medical condition and I found the products brilliant for my skin, they haven't caused any irritation at all, and I think they are a fantastic price too. Using these products has definitely made me re think my skin care routine as I use high end products which also carry a high end price and using the Good Things products has shown me that it isn't necessary to spend a fortune to get good products with good ingredients that are good for the skin, so I think Good Things is a great name! At the moment both Boots and Superdrug have a 3 for 2 promotion on Good Things and Sainsburys have the products on a 50% off discount so it is an ideal time to buy the products. I hope you found this review helpful and informative, let me know if you have tried Good Things or if you'd like to try them after reading this review.